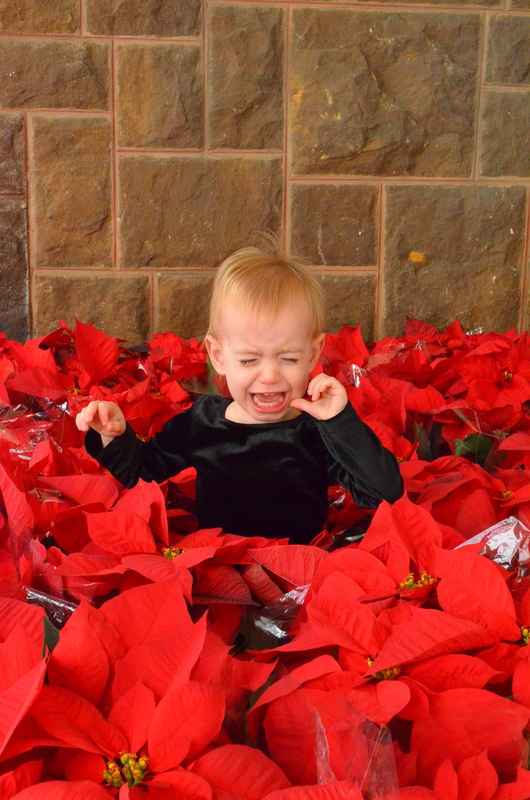 Isla has never been a fan of Santa. 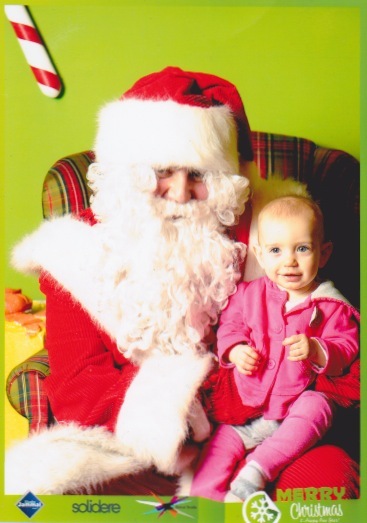 Last year she was more than happy to sit on Santa’s lap when it was her Daddy, but wanted nothing to do with the Santa at the mall. Apparently this past week Isla saw Santa while she was on a field trip and wasn’t scared because her teacher told her kids in KG don’t cry about Santa anymore. And I think the nail polish on this Santa won her over. Ruby on the other hand has never met a stranger, including Santa. She tells us she’s scared of Santa (in the cutest little voice with her hands clenched in fists by her face… “scare!”)… but when push comes to shove, she’ll sit on pretty much anyone’s lap. 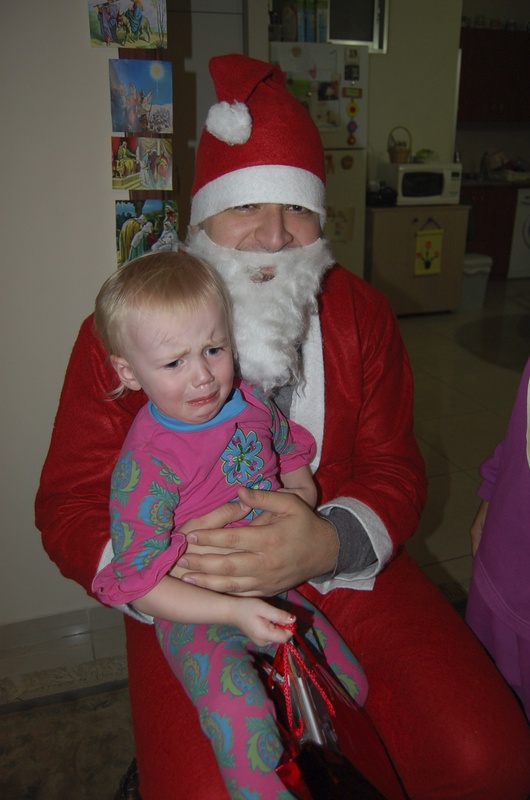 I feel like a bad mom… but I actually crack up at the terrified kid on Santa’s lap pictures. So I’m admittedly bummed that Ruby seems to have no problem with him. Flowers on the other hand…. I could write paragraphs about the cultural experience we had today. How this was the second time we went for the parade because the first time we showed up at the time advertised only to find out there wasn’t actually a parade that day. How we were given a ticket with a time slot to get into Santa’s Village but about 20 minutes after our time came and went they just opened the doors and it was a pushing, shoving free for all to get in. Or about how when we finally pushed our way to the doors they closed them and told us we’d have to wait ten minutes because it was full, only to open the doors to let Nancy Ajram and her family through. Isla is terrified of Santa. She tells us that she’ll probably like him when she’s seven. I’m definitely thankful that we decided not to do the whole Santa-brings-presents-thing, because I think the idea of Santa sneaking into our house while she’s sleeping might very well put her over the edge. Usually at our annual Christmas party with the girls, Santa comes to pass out the gifts. 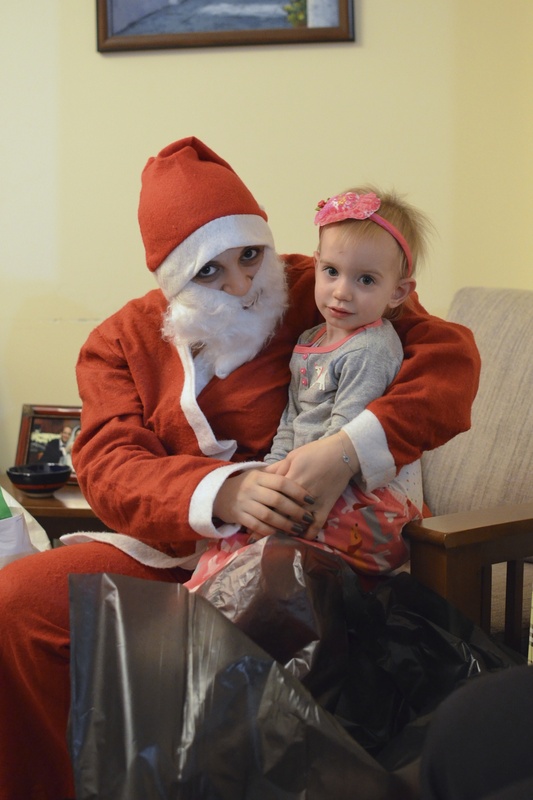 But this year, Mona decided that the girls would make their own Santa – ie, dress up Caleb and Joe – to help alleviate some of the fears that Isla and a few of the younger girls have. 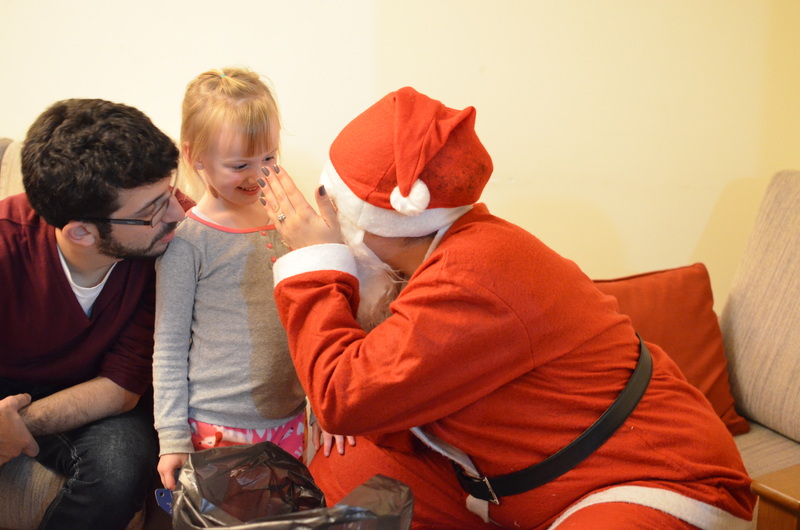 First time Isla has been near a Santa without crying… and she told us over and over that she really likes when Daddy and Joe are Santa, but she still doesn’t like the real one! She had no problem sitting on his lap at the party, but the last picture is about as close as we could get her to the Santa in the mall! No picture yet of Ruby with Santa. We tried to go on Christmas Eve, but apparently “Santa’s Village open every day until Dec 31 from 4-8pm” doesn’t actually mean every day. I’m hoping that since we still have a few weeks before Eastern Christmas that we can find a Santa somewhere. 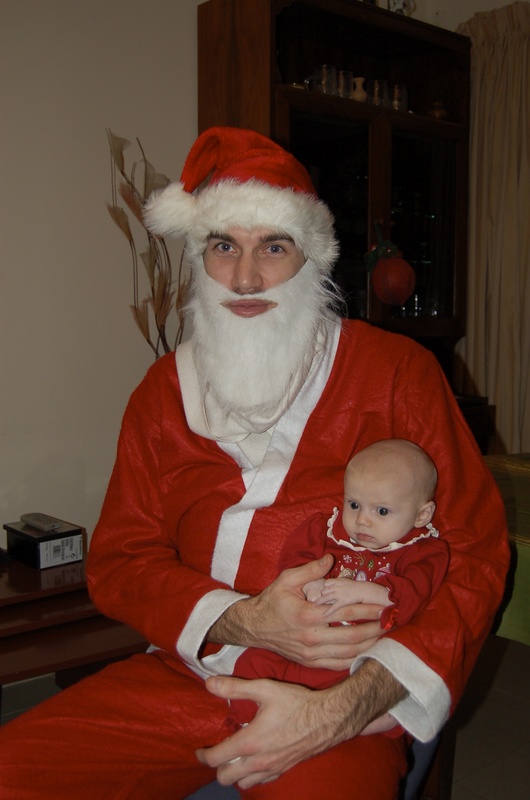 Although I’m not expecting a fun picture like Isla’s given us the past few years… Ruby is a crazy people person and I’m sure she’ll love Santa just as much as every other person in the world! But for the record, she’s also afraid of Mary and Joseph. 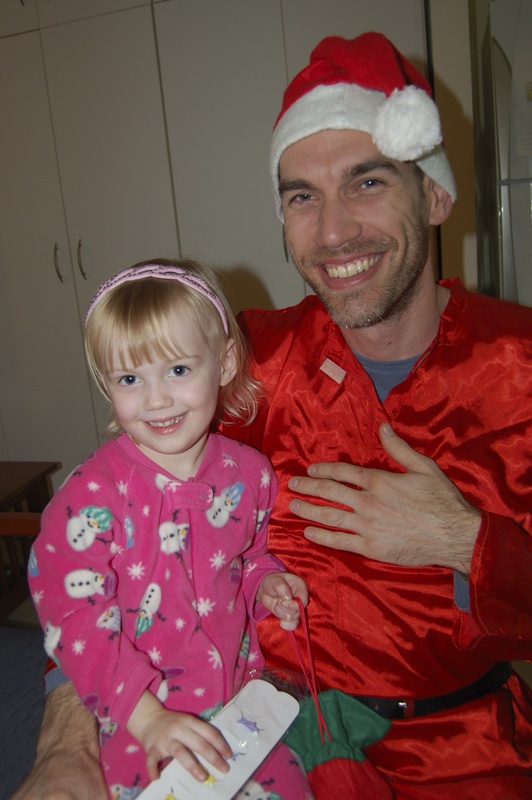 Christmas Week – A visit from Papa Noel!